(P1) A computer program has beaten a master GO player 3-0 in a best-of-five competition, in what is seen as a LANDMARK moment for ARTIFICIAL INTELLIGENCE. 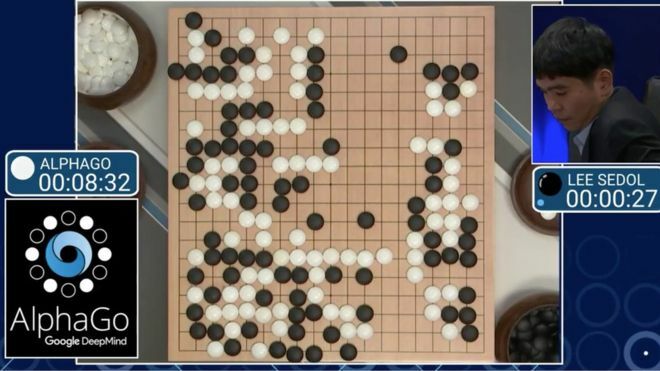 (P2) Google’s AlphaGo program was playing against Lee Se-dol in Seoul, South Korea. (P3) Mr Lee had been confident he would win before the competition started. (P4) The Chinese BOARD GAME is considered to be a much more complex challenge for a computer than CHESS. (P5) “AlphaGo played consistently from beginning to the end while Lee, as he is only human, showed some mental VULNERABILITY,” one of Lee’s former coaches, Kwon Kap-Yong, said. (P6) Mr Lee is considered a CHAMPION Go player, having won numerous professional TOURNAMENTS in a long, successful career. (P7) Go, which was invented in China thousands of years ago, is a game of two players who take turns putting black or white stones on the points of a 19-by-19 grid. Players win by surrounding their opponent’s pieces with their own. (P8) In the first game of the series, AlphaGo won by a very NARROW MARGIN – Mr Lee had led for most of the match. (P9) After losing the second match to AlphaGo, Lee Se-dol said he was “speechless” adding that the AlphaGo machine played a “nearly perfect game”. (P10) The two experts who provided COMMENTARY for the YouTube stream of for the third game said that it had been a COMPLICATED match to follow. (P11) They said that Lee Se-dol had brought his “top game” but that AlphaGo had won “in great style”. (P12) The AlphaGo machine was developed by British computer company DeepMind which was bought by Google in 2014. (P13) It has built up its EXPERTISE by studying older games and learning PATTERNS of play. (P14) “It has played millions and millions of times and each time got INCREMENTALLY better – the machine learns from its mistakes,” DeepMind chief executive Demis Hassabis said. (P15) What does this win mean for artificial intelligence? (P16) Artificial Intelligence (AI) is perfect for games. A closed system of fixed rules suits computing. (P17) When IBM’s Deep Blue supercomputer beat world chess champion Garry Kasparov in 1997, the world was ASTONISHED. But Deep Blue was not the human-like intelligence that the founders of AI had hoped for. It won by searching through millions of moves in seconds. (P18) Go became the HOLY GRAIL of AI gaming. Searching all possibilities won’t work because no search could be fast enough. There are more possible positions in Go than there are ATOMS in the universe, and a player usually has a choice of 200 moves. (P19) To beat one of the world’s top players, AlphaGo uses a MIXTURE of CLEVER methods to make the search PARAMETERS much smaller. (P20) Does all this mean that AI will soon take your job? Possibly you should be more worried about that. Have you ever played go, chess, or other similar board games? Are these games popular in your country? Do you think that your job could EVENTUALLY be done by a computer? If computers take many more jobs, how will people earn money?